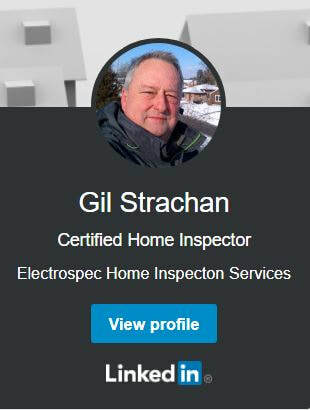 As a career technician, Gil Strachan brought 20 years of diagnostic experience to the company, as well as several years experience in renovation and restoration. Gil has completed numerous building trades-related courses, Ontario Building Code courses and formal home inspection training. He is a WETT Certified Wood Heating Inspector, Septic Systems Inspector and is certified by the TSSA and ASHI. An experienced home inspector working full-time in this field since 1994, Gil Strachan is also a National Certificate Holder and a certified member of PHPIC. Now here's a guy who spends so much time looking at other peoples' houses, he can hardly find time to look at his own! On the rare day when he's not inspecting someone's new home, Gil is "chief cook & bottle washer" and resident Computer Geek. He writes a weekly newspaper column, and edits All Around The HOUSE in both hard copy and email formats. He loves food, travel and the outdoors. Note: He probably get crumbs all over the keyboard!